7-year-old sorrel mare came in with a super enlarged right hock. 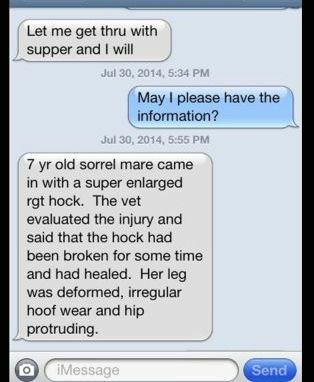 The vet evaluated the injury and said that the hock had been broken for some time and had healed. Her leg was deformed, irregular hoof wear and hip protruding. 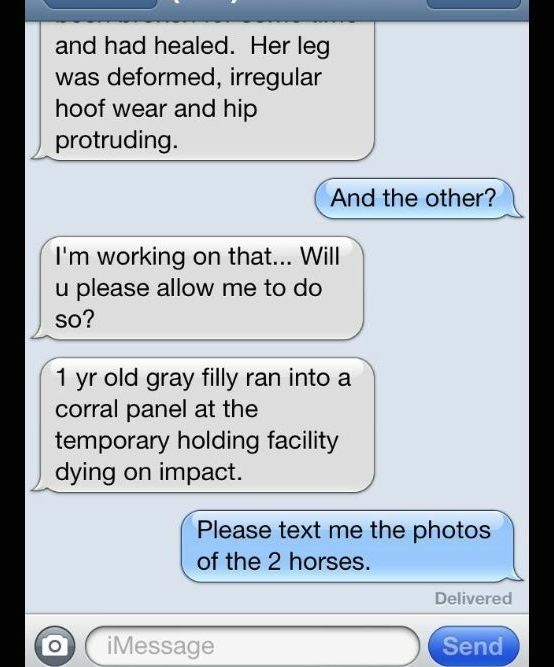 1-year-old grey filly ran into a corral panel at the temporary holding facility dying on impact. I never received any photos of the 2 wild horses and we know BLM documents the wild horses at the roundups. Politicians who want to get public land transferred to their state pushed for this roundup. They went all the way to Washington to convince elected officials that wild horses were starving and ruining the range despite the fact that cattle outnumber them more than 50 to 1 and the wild horses are healthy and fat. . . These are the same politicians who are pushing for the Wild Horse Oversight Act, H.R. 5058 to let the states manage them and be able to ‘dispose of’ federally protected wild horses as they choose. They want American wild horses ripped off public land in what seems to be retaliation for the Bundy Ranch incident and because local politicians have a deep conflict of interest favoring livestock grazing. They are trying to scapegoat range damage on wild horses when livestock is the culprit. Elected officials in Utah have threatened to take the matter into their own rogue hands, round up native wild horses, kill them or sell them to slaughter! They don’t realize wild horses have a right to live on public land and grazing livestock is only a privilege. Their sense of entitlement to federal lands has warped their perspective. Despite public outcry against the proposed roundup, BLM buckled under pressure and started chasing wild horses with helicopters on Monday. 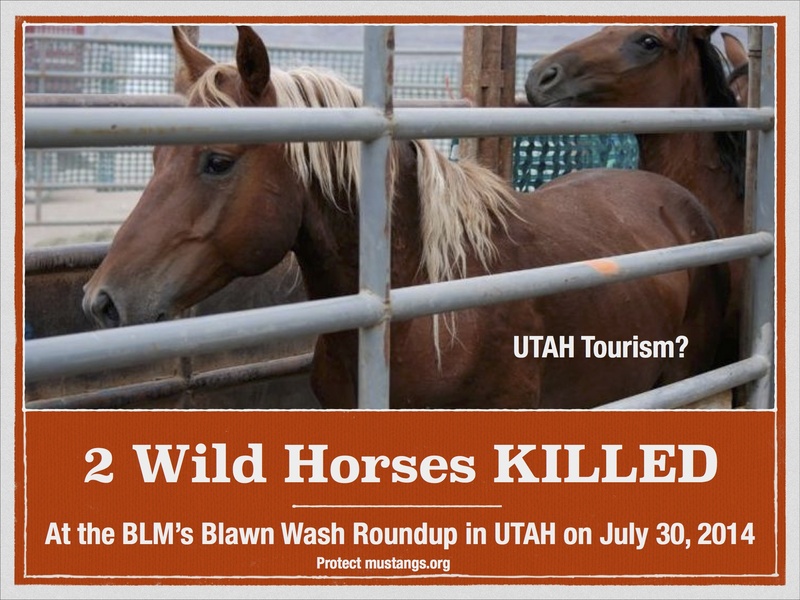 . . On day three, legendary wild horses are killed because of the roundup. In March 2014, 37 Wyoming wild horses were sold to a Canadian slaughterhouse–after the BLM’s Dry Creek roundup–to be killed for human consumption. We saved 14 youngsters we call the WY14 but sadly 23 herd members were slaughtered before we got involved. In August 2013, many wild horses were sold to kill-buyers after the brutal Fort McDermitt roundup . . .
Then there is Tom Davis who wasn’t able to account for the more than 1,700 wild horses the BLM sold and delivered to him for only $10 a head after the roundups. The public wants an immediate moratorium on roundups for recovery and management studies. BLM’s roundups and removals have increased the birthrate because native horses fear extinction when their population drops too low. Wild horses are not overpopulated on public land. If anything they are so underpopulated their genetic variability is at risk. Please share this post with your friends and family so they can learn the truth about how the feds are spending their tax dollars to harass American wild horses with helicopters and scare them to their death or kill them after they have been trapped. Pray for America’s wild horses. We need a miracle for them to survive corrupt politics surrounding public land. May the mare and yearling filly who died today rest in peace . . . forever running free. What happened to wild mama Cleo and her foal? Is Cleo (mare #04616386) still alive at the BLM’s long-term holding or was she sold to a pro-slaughter buyer? When I helped an adopter track down the Litchfield 11 filly known as “Lily” I requested more information about Cleo who was shipped to long-term holding last spring. We have an adopter interested in saving Cleo and her foal if they are still alive. I have been worried about the Calico mare seen in the video below. Is she still alive? Was she sold into the slaughter pipeline? What happened to her foal? What happens to all the foals born in long-term holding? I will keep you posted as the information comes in. Right now I’d like to shine the light on this issue and share my emails with you. Will you confirm that Calico mare #04616386 is alive and well and living at the Nowata facility or was she sold to a pro-slaughter buyer such as Tom Davis with other wild horses by the truckload? Where exactly will the weanlings go? Where will they receive their identification numbers? Or have they already? Please provide us with an identification list for the weanlings and accountability for any of the 130 who die. What vaccinations are given to the weanlings at the long-term pastures and what is their age range at the time of receiving the vaccinations? Do you have a link for the Nowata facility? We are concerned that an Oklahoma’s Senator would rather see them slaughtered as quoted in an article about the long-term program. U.S. Sen. Tom Coburn, R-Muskogee, is bucking the program he calls “mismanaged.” He wants easier adoptions and better, longer-lasting infertility drugs. “I think you ought to allow those that can’t survive, can’t be adopted, to be sold for slaughter,” he said. How can you guarantee these horses will be safe? How many are ‘sold’ from Oklahoma facilities? I just spoke to one of our long-term pasture specialists and we have already weaned 130 foals off of the Nowata, OK, long-term pasture. The foals were given their first shots today and the mares have already returned to the pastures. The foals will stay there for approximately another 3 weeks before shipping to a short-term adoption center. The Nowata contract is new; therefore, it has four years before it is up for renewal. The BLM has no control over what Congress decides to do with funding for the program; therefore, we will continue to feed and care for the horses in holding. Thank you. We understood that the long-term pasture contractors roundup the horses at least once a year to wean the foals and count. Is that is October? Please provide us with a list of all the weanlings coming from the long term pasture where mare #04616386 is. Let us know where the weanlings are now. Have any of these weanlings been adopted? Do any of them have strikes against them? In what pasture exactly is mare #04616386 located? When is their contract up for renewal? If Congress reduces funding for long-term holding what will happen to mare #04616386? We would like to request she be pulled out for adoption the next time they do an inventory or has she already been sold to a pro-slaughter buyer like Tom Davis? At this time, it is not economically feasible to remove a single horse from our long-term pastures. They are expansive pastures and the horses are free-roaming. I explained this in the questions you submitted earlier, so I’m sorry we can’t accommodate the request. We don’t send mares, with foals, to long-term pastures and our database does not track which mare goes with which foal. Therefore, if the mare was pregnant when she shipped to OK, she will foal there. But, we will not be able to guarantee which foal came from which mare. I hope this answers your question. Thank you. Yes I heard the good news about Lily and it’s my pleasure to help these magnificent wild horses find homes even though I would rather they were not removed from their homes and families in the first place. Please help me find the foal belonging to mare #04616386 at the BLM facility. How do you identify them? How can the adopter adopt mare #04616386? They have wanted her since they saw her at Palomino Valley but they were told she had shipped out to long term holding. In case you haven’t heard, the little filly is in the process of being adopted by Dr. Wines. Thank you for part in helping Lily have a new home. In reference to the mare, BLM does not use mares on long-term pastures for medical/fertility research. All of our long-term pastures are privately-owned. The BLM simply leases the space and pays them to provide feed and care to the horses. If a mare is pregnant, when entering a long-term pasture, it will foal there. Once the foal is old enough to be weaned, it will be sorted off and usually shipped to our Pauls Valley, OK, facility, or Hutchinson, KS, facility for adoption. My understanding is that filly #11223361 has 2-Strikes. Is that correct? Regarding mare #04616386, is she currently at the long-term pasture in Nowata, OK, is that a BLM contracted facility or owned by BLM? Is the facility open to the public? 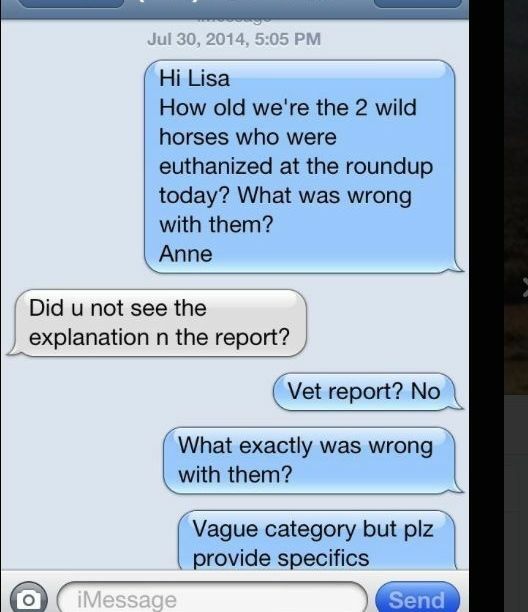 Is the mare #04616386 being used for medical and/or fertility control research? She was in foal when she was rounded up. Where is her foal and what is her foal’s number? How does an adopter adopt mare #04616386? Dear Ms. Novak. Hope you enjoyed your holidays. As listed on the information I forwarded to you on November 15, #11223361 is available for adoption at our BLM facility in Elm Creek, Nebraska. Anyone that is interested in adopting this horse will need to go to the Elm Creek facility. If the interested party lives very far away, I would suggest the person call them at 308-856-4498 to ensure it is still there. This facility is open to the public on a daily basis, excluding holidays and weekends, so it can be adopted at any time or shipped to a future adoption. Thank you for sharing this information with them. Based on the info you provided for #6386, we narrowed it down to #04616386. This horse was gathered from the Calico HMA on December 6, 2011 and was shipped to our long-term pasture in Nowata, OK, on March 20, 2012. Please note it does not have any strikes. An adopter is interested in the California yearling filly #3361. She was sent to Nebraska and then to the Indiana adoption event. Where is #3361 now? How can the adopter get her?